Here’s a practical way to keep your ‘Welcome’ sign up to date – simply change the painted wooden shapes that you hang from it to represent the current season! 1. Start by drilling a hole at the top of each wood shape. Sand your pieces if needed. 2. For the wooden plaque, I painted the sides gold and the top white. I hand-painted the design, but a stencilled design would look great too. 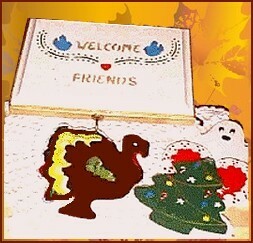 Be sure to include the letters “Welcome Friends” in gold or a color of your choice. 3. Load a paint brush or an old toothbrush with gold paint and use this to splatter dots of the gold on the top. Don’t go overboard – a little splatter looks better than too much. 4. When the front is dried, paint the back in any color to seal and protect the wood. When the paint is dry, attach the screw hook at the bottom center, facing to the front. 5. For the wood shapes, I looked in books and magazines and coloring books, and painted the shapes. Paint the backs a sold color, let dry and seal with a sealer. 6. Now you can change the wood shapes for each holiday or season. Just attach the appropriate seasonal wood shape to the screw hook. This is a great quick and easy homemade gift. Enjoy!